Students will be able to generate synonyms and antonyms for target words. Draw a circle on the board with the word "big" inside. This is the start of a word web. In blue, draw a line out from the center circle and write the word "large." Ask students to call out other words that have a similar meaning to the word "big." Branch out from the center circle, and write their answers in blue. 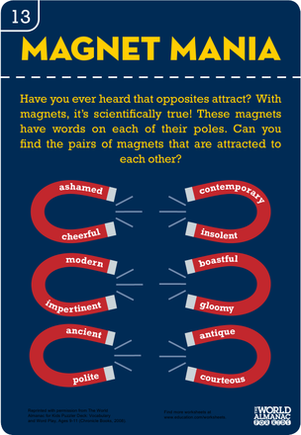 Remind students that words that have similar meanings are called synonyms. Write the definition on the board in blue. In red, draw a line out from the center circle and write the word "small." Ask students to call out other words with meanings that are opposite of "big." Branch out from the center circle and write their answers in red. Remind students that words with opposite meanings are called antonyms. Write the definition on the board in red. Explain that synonyms and antonyms can help us build our vocabulary. They can help us make our writing more interesting. For example, instead of saying, "The big dog chewed on a big bone," we might replace the word "big" with a synonym and say, "The large dog chewed on a colossal bone." Remind students that synonyms have similar meanings, but each word may have slightly different connotations. For example, "colossal" means "extremely big" so it would be appropriate when describing a blue whale but not when describing your biggest pencil. Use a document camera to show students how to use a thesaurus. Remind students that a thesaurus is a tool that lists synonyms and antonyms for words. Choose a word to look up, like "big." Tell students that words are listed alphabetically, so they can search for it like they would in a dictionary. Point out the target word ("big") and direct students' attention to the words that are listed alongside the target word. Explain that, depending on the thesaurus you use, there will be many synonyms, but only one or two antonyms. Tell students that, to find more antonyms, they can look for synonyms of a known antonym. For example, to find more antonyms for "big," they could look for synonyms of "small." Remind students to be careful when choosing a synonym to replace their target word. If they are not sure about the specific meaning of a synonym, they should use a dictionary to find the definition of the synonym (remind them of the example: "colossal" vs. "big"). 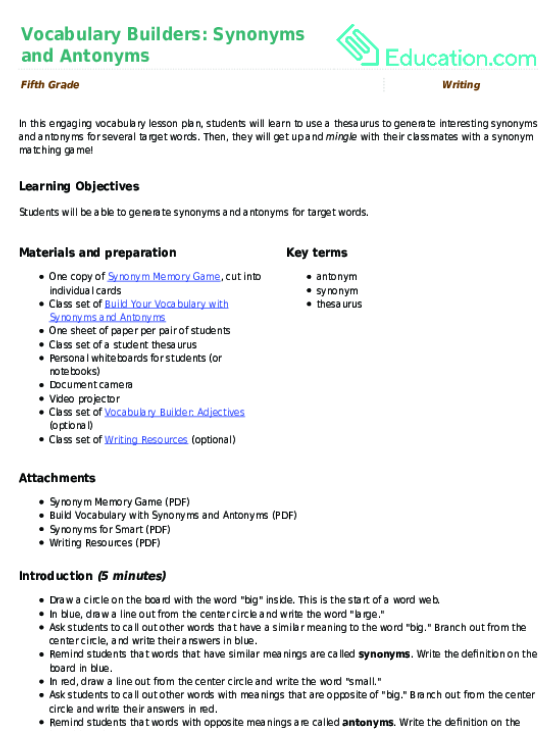 Hand out cards from the Synonym Memory Game so that each student receives one card. Play a mingle game with the cards: Have students walk around the room looking for someone who has a synonym for the word on their card. Tell students to choose one of the words on their synonym cards and use the thesaurus to make a word web with their partner. Remind students to include synonyms and antonyms on their word web, like the example word web from earlier in the lesson. 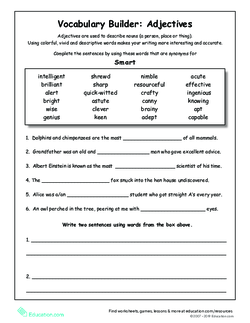 Hand out the worksheet Build Your Vocabulary with Synonyms and Antonyms. Instruct students to complete the worksheet independently. Circulate and offer support as needed. Have students look up the word on their card prior to the mingle game. Tell them to write the definition and/or several synonyms on the back of the card before looking for their synonym partner. Allow students to use a dictionary and/or thesaurus during independent practice. Review dictionary and thesaurus basics with the worksheet Writing Resources (see optional materials). In lieu of the independent practice worksheet, have students focus on synonyms for just one target word, like "smart" (see optional materials). 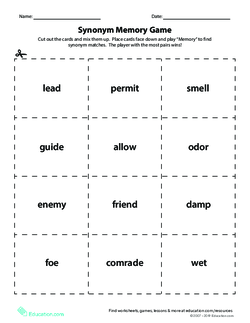 Allow students to play the synonym memory game during word work time in class. Have students look back at a piece of their own writing and replace boring words, like "happy" or "big," with more interesting synonyms. On the board, write a target word, like "happy." Instruct students to write a synonym and an antonym for the target word on their personal whiteboard (i.e., "joyful," "sad"). Have students hold up their whiteboards and scan their answers to gauge understanding. Call on a student to read their synonym out loud. Then call on a student to read their antonym. Repeat with several target words, like "young", "slow," and "dark." Play a song for students to review the concepts that were covered in the lesson, like "A Smile and a Frown" by Grammaropolis (see related media). In this engaging vocabulary lesson plan, students will learn to use a thesaurus to generate interesting synonyms and antonyms for several target words. This exercise’s further practice identifying synonyms and antonyms will reinforce your students’ understanding of like and opposite words. Kids grow their vocabulary with antonyms and synonyms in this worksheet. Assess your students’ knowledge of common synonyms and antonyms. 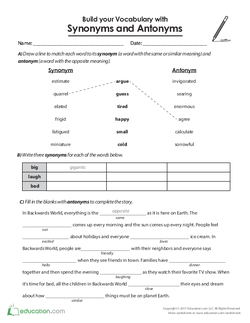 Help your child practice antonyms with this fifth grade vocabulary worksheet. Reinforce your child's vocabulary skills with this fun worksheet, which challenges your child to find synonyms for Jill's three wishes. 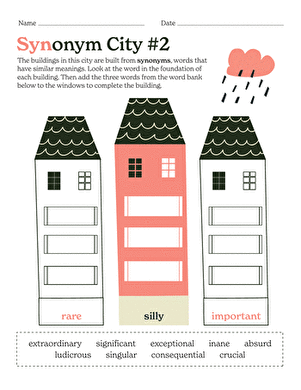 Students will have fun matching synonyms with this vocabulary memory game. Hook your students with this vocabulary builder that encourages them to draw emojis as they explore synonyms and strengthen their emotional intelligence. Boost your child's vocabulary with this fun worksheet challenge, which requires your child to find synonyms for the words "fast" and "slow." 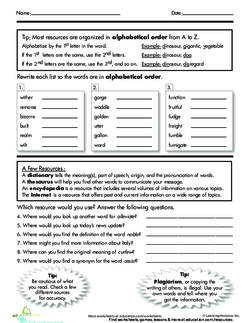 Help your fifth grader improve his vocabulary with this vocab building worksheet, which will ask him to find three synonyms for three different words.